A mattress manufacturer needed to move from an existing 270,000 sq. ft. facility to a 130,000 sq. ft. facility. It was assumed that an additional second facility would be required to maintain current inventory levels. The existing storage method was selective pallet racking, (3) pallets high, with approximately 18’ aisles. 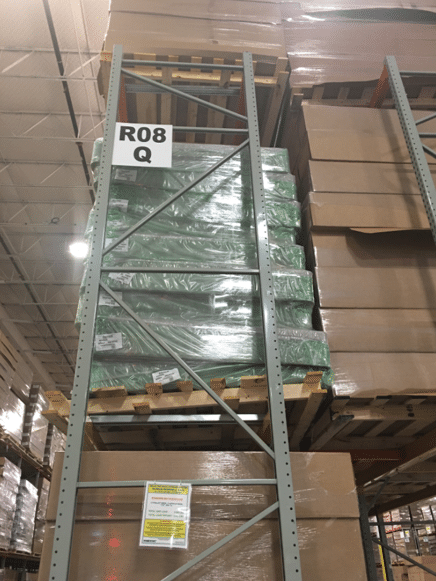 After analyzing the manufacturer’s SKUs, it was determined that a significant percentage of items were stored at multiple pallet quantities. This allowed the mattresses to be stored in a 2-deep configuration. Because the pallets were customized, a standard drive-in system would not be applicable. We proposed a 2-deep drive-in racking system which increased storage density while allowing the manufacturer to continue using their existing lift equipment. This design incorporates longer drive in support arms which cantilever and will also allow for not only King pallets to be stored in the system, but Queen, Double and Twin pallets as well.